WASHINGTON, DC--(Marketwired - September 26, 2017) - Although nearly every American adult considers homeownership a key component of the American Dream, thousands of would-be homebuyers -- especially people of color and millennials -- are shut out from the market because of confusion about down payment requirements, lack of information about credit standards and the burden of student loan debt, according to the fifth annual America at Home survey from NeighborWorks America. Over the past year, government-sponsored mortgage agencies and both large and small lenders have launched mortgage products with low down payments and broader credit standards; however, a significant number of Americans are not aware of these programs or are confused about their requirements. Millennial and nonwhite consumers are particularly confused about how to qualify for a mortgage, and these are the demographic groups that will influence the strength of the housing market for years to come. 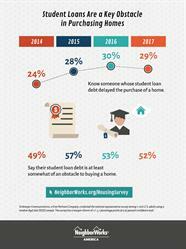 29 percent of consumers know someone who has delayed homeownership as a result of student loan debt. Ninety-three percent of adults believe owning a home is part of the American Dream. Eighty-one percent of adults and 72 percent of millennials say homeownership increases financial stability. Seventy-four percent of adults and 84 percent of millennials perceive the home buying process as complicated. The NeighborWorks survey found that 70 percent of adults feel they don't have enough money saved for a down payment. That's not surprising considering that, on average, consumers think 17 percent is the minimum down payment required to buy a home. In fact, however, a down payment as small as 3.5 percent is sufficient for many mortgage products. Younger consumers believe even a higher amount is required for a down payment, with, on average, those 18-24 years old thinking that a 25 percent down payment is necessary. Seventy-eight percent of renter millennials say they "don't" or "probably don't" have enough money for a down payment, compared to 70 percent of adult renters overall. The confusion about minimum down payment requirements is compounded by a general lack of awareness about assistance programs. Approximately 73 percent of all consumers and 62 percent of millennials say they are not aware or are unsure about down payment assistance programs in their communities for middle-income homebuyers. Of those surveyed who have heard of down payment assistance programs, 53 percent report receiving "not much information" or "nothing at all" about them, a signal for providers to increase their marketing efforts to reach more consumers. 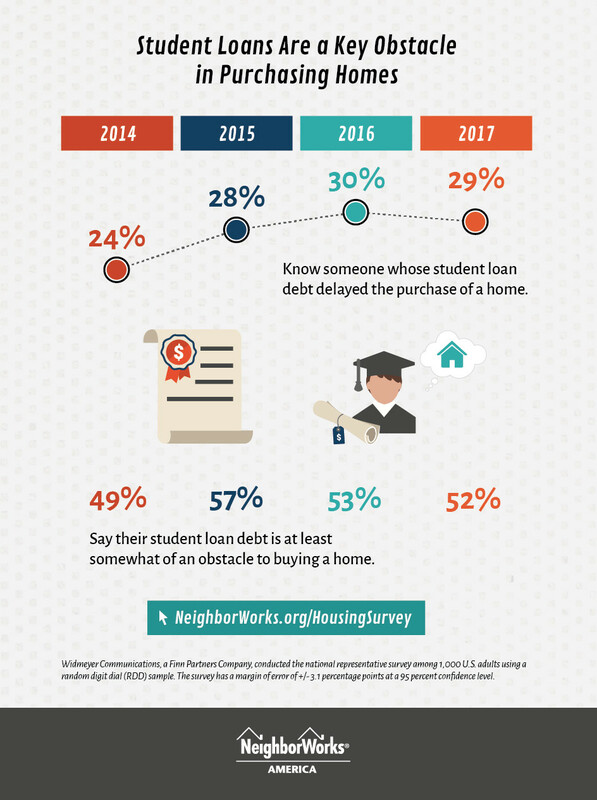 Credit concerns are the second-biggest obstacle to homeownership highlighted in the NeighborWorks survey, with 17 percent of all adults and 22 percent of millennials citing credit as a barrier. However, the median FICO score (a measure of credit used when applying for a mortgage) was 700 in April, well above the mortgage-qualifying rate of 620 published by many mortgage lenders and government-sponsored enterprises. While some consumers looking to purchase a home have scores below the median, many are not aware of the strength of their credit and thus mistakenly believe they are unable to obtain a mortgage. This may be especially true for people of color. Twenty-one percent of nonwhite respondents cited credit as a home buying obstacle, slightly more than the 19 percent who listed lack of down payment funds. This is an opportunity for nonprofit organizations to increase outreach about their homebuyer education and counseling services. Approximately one in four (26 percent of) adults in America have student loan debt, and more than half of millennials carry this burden, according to the survey. This has had a major impact on their home buying behavior, with nearly one in four millennials reporting they have delayed buying a home because of student loan debt. Likewise, more than one-third of millennials say they know someone who has delayed buying a home because of student loans. When asked to rate where student loan debt stands as an obstacle to homeownership, using a scale of 1-10 (with the latter being the most onerous), nearly 18 percent of both the total adult population and millennials chose either nine or 10. Student loan debt is a major source of anxiety: Half of millennials, 47 percent of nonwhite consumers and 43 percent of the general population worry about their student loans "all" or "most" of the time. Similar to the lack of good information about credit and down payment assistance, most consumers with student loan debt are not aware of help available to manage the cost. Sixty-five percent of everyone with student loan debt and 70 percent of millennials report they are "not too familiar," are "not at all familiar" or have "never heard of" nonprofit organizations that offer free or low-cost help. Editor's note: Widmeyer Communications, a Finn Partners Company, conducted the national representative study using an online panel, including 1,000 adults aged 18 or older, with an additional, separate sample of 500 millennials, defined as aged 18-34. For nearly 40 years, Neighborhood Reinvestment Corp. (D/B/A NeighborWorks America), a national, nonpartisan nonprofit, has created opportunities for people to improve their lives and strengthen their communities by providing access to homeownership and to safe and affordable rental housing. In the last five years, NeighborWorks organizations have generated more than $27.2 billion in reinvestment in these communities. NeighborWorks America is the nation's leading trainer of community development and affordable housing professionals.